Rodrigo Díaz de Vivar (c. 1043 – 10 July 1099) was a Castilian nobleman and military leader in medieval Spain. The Moors called him El Cid (Spanish pronunciation: [el̟ˈθið]), which meant the Lord (probably from the original Arabic al-sayyid, السَّيِّد), and the Christians, El Campeador, which stood for "Outstanding Warrior" or "The one who stands out in the battlefield". He was born in Vivar del Cid, a town near the city of Burgos. After his death, he became Castile's celebrated national hero and the protagonist of the most significant medieval Spanish epic poem, El Cantar de Mio Cid. El Cid found work fighting for the Muslim rulers of Zaragoza, whom he defended from its traditional enemy, Aragon. While in exile, he regained his reputation as a strategist and formidable military leader. He repeatedly turned out victorious in battle against the Muslim rulers of Lérida and their Christian allies, as well as against a large Christian army under King Sancho Ramírez of Aragon. In 1086, an expeditionary army of North African Almoravids inflicted a severe defeat to Castile, compelling Alfonso to overcome the resentments he harboured against El Cid. The terms for the return to the Christian service must have been attractive enough since Rodrigo soon found himself fighting for his former Lord. Over the next several years, however, El Cid set his sights on the kingdom-city of Valencia, operating more or less independently of Alfonso while politically supporting the Banu Hud and other Muslim dynasties opposed to the Almoravids. He gradually increased his control over Valencia; the Islamic ruler, Yahya al-Qadir [es], became his tributary in 1092. When the Almoravids instigated an uprising that resulted in the death of al-Qadir, El Cid responded by laying siege to the city. Valencia finally fell in 1094, and El Cid established an independent principality on the Mediterranean coast of Spain. He ruled over a pluralistic society with the popular support of Christians and Muslims alike. El Cid's final years were spent fighting the Almoravid Berbers. He inflicted upon them their first major defeat in 1094, on the plains of Caurte, outside Valencia, and continued resisting them until his death. Although Rodrigo remained undefeated in Valencia, his only son, and heir, Diego Rodríguez died fighting against the Almoravids in the service of Alfonso in 1097. After El Cid's death in 1099, his wife, Jimena Díaz, succeeded him as ruler of Valencia, but she was eventually forced to surrender the principality to the Almoravids in 1102. The name El Cid (Spanish: [el ˈθið]) is a modern Spanish denomination composed of the article el meaning "the" and Cid, which derives from the Old Castilian loan word Çid borrowed from the dialectal Arabic word سيد sîdi or sayyid, which means "Lord" or "Master". The Mozarabs or the Arabs that served in his ranks may have addressed him in this way, which the Christians may have transliterated and adopted. Historians, however, have not yet found contemporary records referring to Rodrigo as Cid. Arab sources use instead Rudriq, Ludriq al-Kanbiyatur or al-Qanbiyatur (Rodrigo el Campeador). The cognomen Campeador derives from Latin campi doctor, which means "battlefield master". He probably gained it during the campaigns of King Sancho II of Castile against his brothers King Alfonso VI of León and King García II of Galicia. While his contemporaries left no historical sources that would have addressed him as Cid, they left plenty of Christian and Arab records, some even signed documents with his autograph, addressing him as Campeador, which prove that he used the Christian cognomen himself. The whole combination Cid Campeador is first documented ca. 1195 in the Navarro-Aragonese Linage de Rodric Díaz included in the Liber Regum under the formula mio Cid el Campeador. El Cid was born Rodrigo Díaz circa AD 1043 in Vivar, also known as Castillona de Bivar, a small town about six miles north of Burgos, the capital of Castile. His father, Diego Laínez, was a courtier, bureaucrat, and cavalryman who had fought in several battles. Despite the fact that El Cid's mother's family was aristocratic, in later years the peasants would consider him one of their own. However, his relatives were not major court officials; documents show that El Cid's paternal grandfather, Lain, confirmed only five documents of Ferdinand I's; his maternal grandfather, Rodrigo Álvarez, certified only two of Sancho II's; and El Cid's father confirmed only one. As a young man in 1057, Rodrigo fought against the Moorish stronghold of Zaragoza, making its emir al-Muqtadir a vassal of Sancho. In the spring of 1063, Rodrigo fought in the Battle of Graus, where Ferdinand's half-brother, Ramiro I of Aragon, was laying siege to the Moorish town of Cinca, which was in Zaragozan lands. Al-Muqtadir, accompanied by Castilian troops including El Cid, fought against the Aragonese. The party slew Ramiro I, setting the Aragonese army on the run, and emerged victorious. One legend has said that during the conflict, El Cid killed an Aragonese knight in single combat, thereby receiving the honorific title "Campeador". Marcos Giráldez de Acosta painting (1864) depicting the " Santa Gadea Oath". In the middle of the scene, Alfonso VI (with red cape) is swearing with his right hand on the Bible that he did not take part in the murder of his brother Sancho II, while El Cid stands as a witness in front of him. Sancho was assassinated in 1072, possibly as the result of a pact between his brother Alfonso and his sister Urraca. Since Sancho died unmarried and childless, all of his power passed to his brother Alfonso who, almost immediately, returned from exile in Toledo and took his seat as king of Castile and León. He was, however, deeply suspected of having been involved in Sancho's murder. According to the epic of El Cid, the Castilian nobility led by El Cid and a dozen "oath-helpers" forced Alfonso to swear publicly on holy relics multiple times in front of Santa Gadea (Saint Agatha) Church in Burgos that he did not participate in the plot to kill his brother. This is widely reported[who?] as truth, but contemporary documents on the lives of both Rodrigo Diaz and Alfonso VI of Castile and León do not mention any such event. Rodrigo's position as armiger regis was taken away and given to Rodrigo's enemy, Count García Ordóñez. In 1079, Rodrigo was sent by Alfonso VI to Seville to the court of al-Mutamid to collect the parias owed by that taifa to León–Castile. While he was there Granada, assisted by other Castilian knights, attacked Seville, and Rodrigo and his forces repulsed the Christian and Grenadine attackers at the Battle of Cabra, in the (probably mistaken) belief that he was defending the king's tributary. Count García Ordóñez and the other Castilian leaders were taken captive and held for three days before being released. In the Battle of Cabra (1079), El Cid rallied his troops and turned the battle into a rout of Emir Abdullah of Granada and his ally García Ordóñez. However, El Cid's unauthorized expedition into Granada greatly angered Alfonso, and May 8, 1080, was the last time El Cid confirmed a document in King Alfonso's court. This is the generally given reason for El Cid's exile, although several others are plausible and may have been contributing factors: jealous nobles turning Alfonso against El Cid, Alfonso's own animosity towards El Cid and an accusation of pocketing some of the tribute from Seville. The exile was not the end of El Cid, either physically or as an important figure. After being rejected by Ramon Berenguer II, El Cid journeyed to the Taifa of Zaragoza where he received a warmer welcome. In 1081, El Cid went on to offer his services to the Moorish king of the northeast Al-Andalus city of Zaragoza, Yusuf al-Mu'taman ibn Hud, and served both him and his successor, Al-Mustain II. He was given the title El Cid (The Master) and served as a leading figure in a diverse Moorish force consisting of Muladis, Berbers, Arabs and Malians. Andalusian Knights found El Cid their foe ill, thirsty and exiled from the court of Alfonso, he was presented before the elderly Yusuf al-Mu'taman ibn Hud and accepted command of the forces of the Taifa of Zaragoza as their Master. That kingdom was divided between al-Mutamin (1081–1085) who ruled Zaragoza proper, and his brother al-Mundhir, who ruled Lérida and Tortosa. El Cid entered al-Mutamin's service and successfully defended Zaragoza against the assaults of al-Mundhir, Sancho I of Aragón, and Ramon Berenguer II, whom he held captive briefly in 1082. In 1084, The Army of the Taifa of Zaragoza under El Cid defeated the Aragonese at the Battle of Morella near Tortosa, but in autumn the Castilians started a loose siege of Toledo and later the next year the Christians captured Salamanca, a stronghold of the Taifa of Toledo. In 1087, Raymond of Burgundy and his Christian allies attempted to weaken the Taifa of Zaragoza's northernmost stronghold by initiating the Siege of Tudela and Alfonso captured Aledo, Murcia blocking the route between the Taifas in eastern and western Iberia. Battle of Quart de Poblet (21 October 1094). El Cid's troops are in green, Almoravids troops are in red. Terrified after his crushing defeat, Alfonso recalled El Cid. It has been shown that El Cid was at court on July 1087; however, what happened after that is unclear. El Cid returned to Alfonso, but now he had his own plans. He only stayed a short while and then returned to Zaragoza. El Cid was content to let the Almoravid armies and the armies of Alfonso fight without his help, even when there was a chance that the armies of Almoravid might defeat Alfonso and take over all of Alfonso's lands. El Cid chose not to fight because he was hoping that both armies would become weak. That would make it easier for him to carry out his own plan to become ruler of the Kingdom of Valencia. Around this time, El Cid, with a combined Christian and Moorish army, began maneuvering in order to create his own fiefdom in the Moorish Mediterranean coastal city of Valencia. Several obstacles lay in his way. First was Berenguer Ramon II, who ruled nearby Barcelona. In May 1090, El Cid defeated and captured Berenguer in the Battle of Tébar (nowadays Pinar de Tévar, near Monroyo, Teruel). Berenguer was later released and his nephew Ramon Berenguer III married El Cid's youngest daughter Maria to ward against future conflicts. El Cid gradually came to have more influence on Valencia, then ruled by Yahya al-Qadir [es], of Berber Hawwara Dhunnunid dynasty. In October 1092 an uprising occurred in Valencia inspired by the city's chief judge Ibn Jahhaf and the Almoravids. El Cid began a siege of Valencia. A December 1093 attempt to break the siege failed. By the time the siege ended in May 1094, El Cid had carved out his own principality on the coast of the Mediterranean. Officially El Cid ruled in the name of Alfonso; in reality, El Cid was fully independent. The city was both Christian and Muslim, and both Moors and Christians served in the army and as administrators. After his demise, but still during the siege of Valencia, legend holds that Jimena ordered that the corpse of El Cid be fitted with his armour and set on his horse Babieca, to bolster the morale of his troops. In several variations of the story, the dead Rodrigo and his knights win a thundering charge against Valencia's besiegers, resulting in a war-is-lost-but-battle-is-won catharsis for generations of Christian Spaniards to follow. It is believed that the legend originated shortly after Jimena entered Burgos, and that it is derived from the manner in which Jimena's procession rode into Burgos, i.e., alongside her deceased husband. During his campaigns, El Cid often ordered that books by classic Roman and Greek authors on military themes be read aloud to him and his troops, for both entertainment and inspiration before battle. El Cid's army had a novel approach to planning strategy as well, holding what might be called "brainstorming" sessions before each battle to discuss tactics. They frequently used unexpected strategies, engaging in what modern generals would call psychological warfare — waiting for the enemy to be paralyzed with terror and then attacking them suddenly; distracting the enemy with a small group of soldiers, etc. (El Cid used this distraction in capturing the town of Castejón as depicted in Cantar de Mio Cid (The Song of my Cid). El Cid accepted or included suggestions from his troops. In The Song the man who served him as his closest adviser was his vassal and kinsman Álvar Fáñez "Minaya" (meaning "My brother", a compound word of Spanish possessive Mi (My) and Anaia, the basque word for brother), although the historical Álvar Fáñez remained in Castile with Alfonso VI. Taken together, these practices imply an educated and intelligent commander who was able to attract and inspire good subordinates, and who would have attracted considerable loyalty from his followers, including those who were not Christian. It is these qualities, coupled with El Cid's legendary martial abilities, which have fuelled his reputation as an outstanding battlefield commander. Babieca or Bavieca was El Cid's warhorse. Several stories exist about El Cid and Babieca. One well-known legend about El Cid describes how he acquired the stallion. According to this story, Rodrigo's godfather, Pedro El Grande, was a monk at a Carthusian monastery. Pedro's coming-of-age gift to El Cid was his pick of a horse from an Andalusian herd. El Cid picked a horse that his godfather thought was a weak, poor choice, causing the monk to exclaim "Babieca!" (stupid!) Hence, it became the name of El Cid's horse. Another legend states that in a competition of battle to become King Sancho's "Campeador", or champion, a knight on horseback wished to challenge El Cid. The King wished a fair fight and gave El Cid his finest horse, Babieca, or Bavieca. This version says Babieca was raised in the royal stables of Seville and was a highly trained and loyal war horse, not a foolish stallion. The name in this instance could suggest that the horse came from the Babia region in León, Spain. In the poem Carmen Campidoctoris, Babieca appears as a gift from "a barbarian" to El Cid, so its name could also be derived from "Barbieca", or "horse of the barbarian". Regardless, Babieca became a great warhorse, famous to the Christians, feared by El Cid's enemies, and loved by El Cid, who allegedly requested that Babieca be buried with him in the monastery of San Pedro de Cardeña. His name is mentioned in several tales and historical documents about El Cid, including The Lay of El Cid. A weapon traditionally identified as El Cid's sword, Tizona, used to be displayed in the Army Museum (Museo del Ejército) in Toledo. In 1999, a small sample of the blade underwent metallurgical analysis which confirmed that the blade was made in Moorish Córdoba in the eleventh century and contained amounts of Damascus steel. El Cid was married in July 1075 to Jimena Díaz, said to have been a kinswoman of King Alfonso. The Historia Roderici calls her a daughter of a Count Diego Fernández de Oviedo. Tradition states that when El Cid first laid eyes on her, he was enamoured of her great beauty. El Cid and Jimena had two daughters and a son. The latter, Diego Rodríguez, was killed while fighting against the invading Muslim Almoravids from North Africa at the Battle of Consuegra in 1097. As both the Poem and Chronicle state, Cristina Rodríguez and María were originally married to the Infantes de Carrión along with the generous wedding gifts of his two famous swords, Tizona and Colada. However, in revenge for an incident that the Infantes blamed El Cid for, they tied their wives to trees and left them to die. El Cid saved their lives and avenged himself upon the Infantes, and found them more favorable husbands. Cristina Rodríguez, (known as Elvira by the Poem and the Chronicle) married Ramiro, Lord of Monzón and grandson of García Sánchez III of Navarre. Her own son, El Cid's grandson, would be elevated to the throne of Navarre as King García Ramírez. The other daughter, María (also known as Sol), is said first to have married a prince of Aragon, presumably the son of Peter I, and she later wed Ramon Berenguer III, count of Barcelona. The figure of El Cid has been the source for many literary works, beginning with the Cantar del Mio Cid, an epic poem from the 12th century which gives a partly-fictionalized account of his life. This poem, along with similar later works such as the Mocedades de Rodrigo, contributed to portray El Cid as a chivalric hero of the Reconquista, making him a legendary figure in Spain. In the early 17th century the Spanish writer Guillén de Castro wrote a play called "Las Mocedades del Cid", on which French playwright Pierre Corneille based one of his most famous tragicomedies, Le Cid. He was also a popular source of inspiration for Spanish writers of the Romantic period, such as Juan Eugenio Hartzenbusch, who wrote "La Jura de Santa Gadea", or José Zorrilla, who wrote a long poem called "La Leyenda del Cid". Georges Bizet worked on a Don Rodrigue in 1873 that was set aside and never completed. Jules Massenet wrote an opera, Le Cid, in 1885, based on Corneille's play of the same name. Claude Debussy began work in 1890 on an opera, Rodrigue et Chimène, which he abandoned as unsuitable for his temperament; it was orchestrated for performance by Edison Denisov circa 1993. A 1980 anime called Ruy, the Little Cid co created by Nippon Animation. El Cid was featured in a campaign dedicated to his life in the classic Real Time Strategy game Age of Empires II by Ensemble Studios. ^ Barton, Simon and Richard Fletcher (2000). The World of El Cid: Chronicles of the Spanish Reconquest. Manchester, UK: Manchester University Press. ISBN 9780719052262. ^ Fee, Christopher R. (2011). Mythology in the Middle Ages: Heroic Tales of Monsters, Magic, and Might. ABC-CLIO. p. 161. ISBN 9780275984069. ^ a b Fletcher, Richard A. (1989). The Quest for El Cid. Oxford, UK: Oxford University Press. pp. 166–168, 198. ISBN 9780195069556. ^ See Ramón Menéndez Pidal, «Autógrafos inéditos del Cid y de Jimena en dos diplomas de 1098 y 1101», Revista de Filología Española, t. 5 (1918), Madrid, Sucesores de Hernando, 1918. Digital copy Valladolid, Junta de Castilla y León. Consejería de Cultura y Turismo. Dirección General de Promociones e Instituciones Culturales, 2009–2010. Original in Archivo de la Catedral de Salamanca, caja 43, legajo 2, n.º 72. ^ Georges Martin «El primer testimonio cristiano sobre la toma de Valencia (1098)», en el número monográfico «Rodericus Campidoctor» de la revista electrónica e-Spania, n.º 10 (diciembre de 2010). Online since 22 January 2011. Last time visited November 28th 2011. Complete text (Edition of the Latin text) in José Luis Martín Martín & al., Documentos de los Archivos Catedralicio y Diocesano de Salamanca (siglos XII-XIII), Salamanca, Universidad, 1977, doc. 1, p. 79-81. ^ a b Chaytor, Henry John (1933). "Chapter 3: The Reconquest". 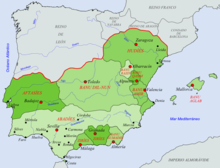 A History of Aragon and Catalonia. London: Methuan. pp. 39–40. ^ The Historia Roderici says that the other two Castilian leaders were Diego Pérez and Lope Sánchez. de los Rios, José Amador (1863). "Capitulo 3: Primeros Monumentos Escritos de la Poesía Castellana (Chapter 3:First Written Monuments of Castilian Poetry)". Historia Crítica de la Literatura Española, Tomo III, (II Parte, Subciclo I) (The History and Criticism of Spanish Literature, Volume III, (Second Part, subpart I)) (in Spanish). Madrid, Spain: J. Rodriguez. p. 104. ^ Giles, Sarah; Giles, Bill (29 December 2014). "Perfect Paradores; The unique hotel chain in Spain... our best of their best hotels! : A Bill and Sarah Giles Travel Guide. Book 8". Yellow Dot Publishing – via Google Books. ^ a b c d Perea Rodríguez, Óscar. "Díaz de Vivar, Rodrigo o El Cid (1043–1099)". Retrieved 23 April 2012. ^ Alonso, J. I. Garcia; Martinez, J. A.; Criado, A. J. (1999). "Origin of El Cid's sword revealed by ICP-MS metal analysis". Spectroscopy Europe. John Wiley & Sons, Ltd. 11 (4). ^ Tom Hill (26 February 2014). Swords of El Cid: "Rodrigo! May God curse him!". Andrews UK Limited. p. 330. ISBN 978-1-78333-651-7. ^ Handbook of Medieval Culture. De Gruyter. 31 August 2015. p. 1739. ISBN 978-3-11-037761-3. ^ Rita Hamilton; Ian Michael (1984). Cantar de mio Cid. Penguin. p. 187. ISBN 978-0-14-044446-9. ^ Southey, Robert (1883). Chronicle of the Cid. New York: Kessinger Publishing, LLC. ISBN 1164438018. ^ Daniel Woolf (17 February 2011). A Global History of History. Cambridge University Press. p. 110. ISBN 978-0-521-87575-2. ^ Gale (2016). A Study Guide for Pierre Corneille's "Le Cid". Gale, Cengage Learning. p. 3. ISBN 978-1-4103-5088-6. ^ Richard A. Fletcher (1991). The Quest for El Cid. Oxford University Press. p. 5. ISBN 978-0-19-506955-6. ^ Gary Allen Smith (22 January 2009). Epic Films: Casts, Credits and Commentary on More Than 350 Historical Spectacle Movies (2nd ed.). McFarland. p. 76. ISBN 978-1-4766-0418-3. ^ Gale (2016). A Study Guide for Anonymous's "Cantar de mio Cid (El Cid)". Gale, Cengage Learning. p. 8. ISBN 978-1-4103-4239-3. Henry Edwards Watts. "The Story of El Cid (1026–1099)" in The Christian Recovery of Spain: The Story of Spain from the Moorish Conquest to the Fall of Granada (711–1492 AD). New York: Putnam, 1894. 71–91. T.Y. Henderson. "Conquests Of Valencia"
J. I. Garcia Alonso, J. A. Martinez, A. J. Criado, "Origin of El Cid's sword revealed by ICP-MS metal analysis", Spectroscopy Europe, 11/4 (1999). "Cid, The" . Encyclopædia Britannica. 6 (11th ed.). 1911. pp. 361–362. This page is based on the Wikipedia article El Cid; it is used under the Creative Commons Attribution-ShareAlike 3.0 Unported License (CC-BY-SA). You may redistribute it, verbatim or modified, providing that you comply with the terms of the CC-BY-SA.